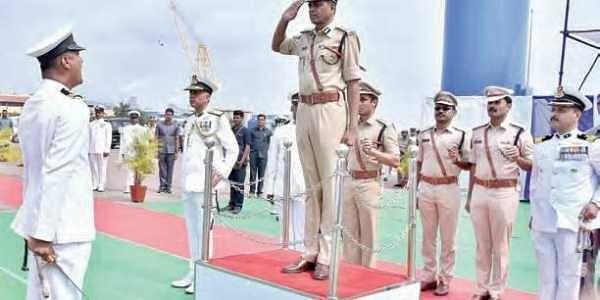 KAKINADA:Indian Coast Guard’s (ICG) boat Charli - 438, an Interceptor Boat (IB), was commissioned at the Kakinada deep water port in East Godavari district on Wednesday. The vessel was inducted as part of the ongoing efforts by the Coast Guard to strengthen coastal security. DGP M Malakondaiah commissioned the IB in the presence of Rajan Bargotra, Inspector General, Coast Guard Region (East) and other distinguished guests from various Central and State agencies.Speaking on the occasion, Malakondiah said that the Indian Coast Guard has great reputation as the fourth largest such agency in the world. He said it has been taking care of coastal security and rescue operations apart from controlling pollution. Its performance is noteworthy, he added. The DGP said steps would be taken to strengthen coastal security to avoid terror threat. He further said marine police and ICG are promoting economic development along the Kakinada coast. He said that the ICGS C - 438 is capable of providing high security on the coast. It has the best technology to deal with any situation in the present situation.Rajan Bargotra, Inspector General of Coast Guard’s Eastern Region, said the government has provided 135 ships and 65 aircrafts in the region. He said the Eastern Region has 700 sailors and 500 officials. It has been taking up recruitment every year. Bargotra said the Interceptor Boat has an infrared surveillance system, so it will keep vigil on the coast even in the night time. He explained about the features of the vessel.The ICGS C-438 shall be based in Kakinada under the administrative and operational control of the Commander Coast Guard Region (East). It will strengthen the security umbrella of East Coast and also help augment patrolling to prevent illicit activities such as infiltration, smuggling and illegal fishing. The ICGS C- 438 Interceptor Boat has 13 sailors. The Interceptor Boat C-438 is 27.8 m in length with a displacement of 106 tonnes and maximum speed of 85 km per hour approximately. The boat is equipped with twin diesel engines, twin water jet propulsion and an endurance of 500 NMs (928 km) at 37 km per hour. The boat is capable of sustaining at sea for a duration of three to four days without replenishment and of undertaking multifarious tasks such as surveillance, interdiction, search and rescue and rendering assistance to boats and crafts in distress at sea.District Collector Karthikeya Mishra, SP Vishal Gunni and Kakinada port vice-president A Muralidhar attended the ceremony.